Even in this modern age, North America is still a fiercely rugged land that is a nature lover’s dream. Of particular mention are the Great Lakes, if for no other reason than because they bring new meaning to the term lake and dwarf virtually all others on Earth as you can’t see from one side to the other. Canada, particularly the provinces of Ontario and Quebec, are home to more lakes than all other places in the world combined, thanks to the retreat of the glaciers from ice ages past. After this recession, the land hand holes punched in it and filled with melting spill water – but some were created a fair bit larger than the others. Surrounding the southern part of the Canadian province of Ontario (if you look on a map, it’s the part that looks like it should be a part of the United States) and a few of the northern American states, are five lakes that you’d really have to work hard at to miss seeing. They are named Huron, Ontario, Michigan, Erie and Superior – or the acronym ‘HOMES’, known by many a schoolchild of the area. They are all connected by a series of rivers and smaller lakes, and eventually pour out into the Atlantic Ocean via the St. Lawrence River. 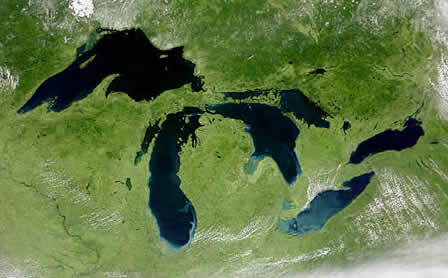 Aside from lake Michigan, which is entirely encompassed by the USA, all of the lakes are shared by Canada and the USA. With that bit of geography taken care of, let’s talk about what makes these lakes great to visit. First up is the natural aspect of them. They are make great places to just sit out by and enjoy. Along these lakes you can wander the many nature trails that are set up, bring a picnic or watch the sun go down at night. Lake Huron is particularly famous for this as it’s coast in Ontario is west facing and perfect for those summer evening sunsets. Second is the urban adventures that await you, as these lakes were and are a major settling point of early Canada. Cities like Toronto and Chicago are located right on these bodies of water for shipping and as an access to drinking water. In the present era, the lakes provide fantastic vantage points to frame the cities and add that element that landlocked cities lack. The city of Kingston in Ontario is right on the mouth of Lake Ontario and the St. Lawrence River, making it perfect for a water cruise to the many islands or just some first rate dining. Third, and most importantly, is the recreation aspect. There are any number of things you can do on these lakes, from swimming to laying out on the beach to checking out natural phenomena like Niagara Falls (best viewed from Canada!). While you’re in Canada, consider heading out onto the water by captaining a boat and experience the freedom of the open water. With tons of marinas lining the many lakes, you’ll have no problem finding a place to launch your boat for fishing or just an all around good time. If you do decide to take to the water (and you’d be crazy not to), be sure to do things right and get your boat licence from BoaterExam so you don’t break any laws during your good time. 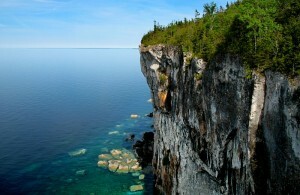 Whatever way you decide to experience the magic of the Great Lakes, you’ll be sure to have a great holiday. With so much to discover, you’ll have a hard time fitting it all into one trip!